A Camaro enthusiast over at LS2forums had a problem: his LS1 engine didn't quite fit under the hood of his normally-aspirated LT1 fourth-gen Camaro. How he solved the problem is explained clearly in a Reddit-style rage comic above. 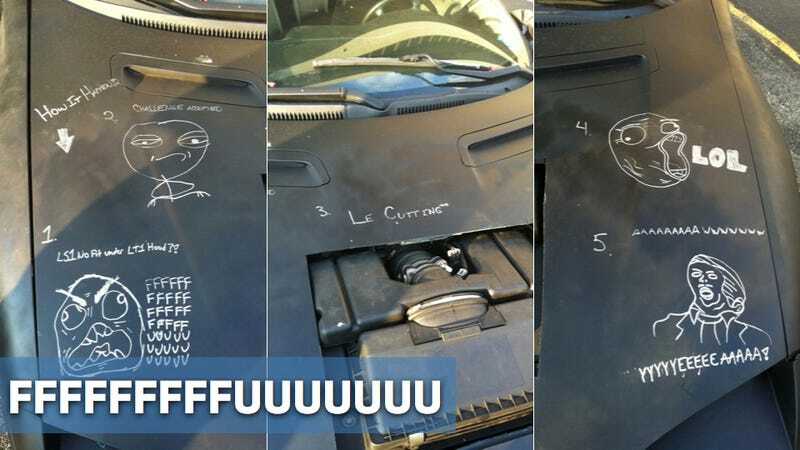 Give credit to enthusiast Mickey Beggs not only for making the swap in his white trash Camaro, but for having the good humor and good sense to poke a little fun at the process. Le Cutting, indeed. One of the posters over on LS1Tech gives a little explanation of the LULS that are occurring for the confused small block faithful. Now he's extra famous. YYYYYEEEEAAAAA!